Creating a brilliant cold email campaign to attract passive candidates is hard. Fortunately, there is a proven science of what makes a cold email tick. Here’s what I’ve seen work after sending thousands of cold emails. Sending out super targeted messages is of paramount importance. Just search recruiter or recruiter email on forums like hacker news and you will see why. Untargeted recruiting emails inspire some very visceral reactions! Sometime back, a simple mishap made me realize this. I used to send a few design versions to three of my colleagues to gather their feedback during our design iterations. I used to do this every week in the middle of the design sprint and it would hardly evoke a response. Once I accidentally sent one email to just one colleague and immediately got a response! The reason is pretty simple. When I send an email to an individual, she knows it was written specifically for her. She knows that I value her opinion. This doesn’t happen when I send the same email to three different people. There are two hacks I use to make sure I stay super targeted in my emails. Cap your outreach: A great way that has worked for me is putting an artificial cap on the number of people I reach out to in a day. 25 to 30 candidates a day is a reasonable limit that helps you stay targeted and disciplined. There are two ways to go about sourcing candidates. The first one is you start narrow and reach out to a few candidates who you think are best suited for the role and widen your search from there. Or you can do it the other way around. Be much more efficient – because you have to source and reach fewer candidates. As the old adage goes – You can’t improve it, if you can’t measure it. This is also a major reasons why starting narrow is a better way – it gives you a clear idea of what’s working and what’s not. If you reach out to candidates who are not best suited for the job, your outreach won’t yield any results. This can leave you guessing and down the path where you keep experimenting with your pitch. The chances are there is nothing wrong with your pitch and you are exactly where you started. Whereas, there are only two reasons if you don’t get responses from best-suited candidates. Either your pitch isn’t appealing enough for them or your idea of best-suited candidates is not accurate enough. In both cases, you can go back to drawing board and avoid committing to a wrong strategy. Sounds like a banal truism doesn’t it? It’s not! We’ve all seen emails that just sound terrible and look like they’ve been sent by a bot or a machine that was fed templates! First reaction – Archive. Your email needs to sound like it came from a human being. The best way I have found to do this is to avoid the first person pronouns – I, we, us and our – and instead use second person pronouns – you, your, yours. This practice forces you into putting yourself in the candidate’s shoes and actually talk to them about the things they care about! If only I had a dime for every time someone reached out to me cold and then never bothered to follow up! Before you even start sending out your first email, you need to have your follow up strategy in place. Never reach out cold without following up. While working with our customers, I am continuously amazed at how many times recruiters don’t bother following up. More often than not I push our users to experiment with it. That’s all! Just experiment on next 100 candidates you reach out. Measure the results and if you think there is a noticeable uptick in the responses you get, that’s great. If not, no harm done. You can easily triple your response rate with simple follow-ups. The best part, you don’t even have to spend time doing that. They can be completely automated and can give you much better results. At recruiterflow we analyzed more than 10,000 cold emails and saw the effects of this. And we did not take the random emails. We took the top 20 percentile of best performing email campaigns on our platform. 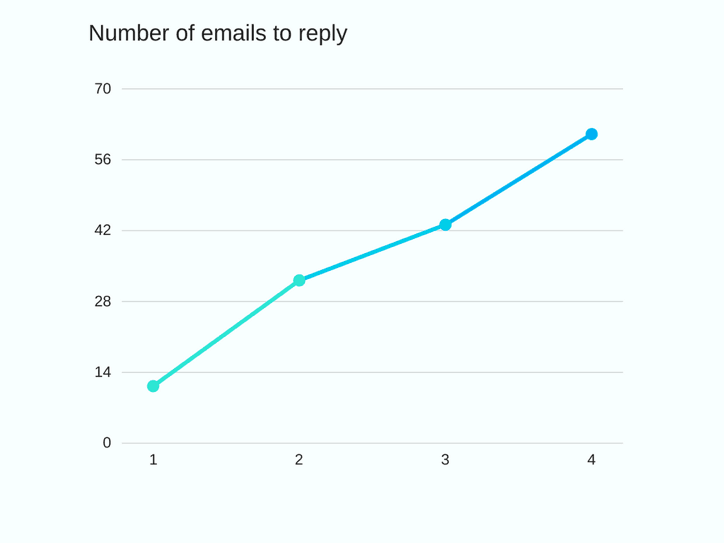 Here’s what the average response rate looked like for each consecutive email in the sequence. The first email gets about 10% candidates replying. By the 4th email, nearly 60% of them have replied! The question you might ask is, how do I follow up. Here’s one that worked fairly okay. That’s it! What I’ve consistently seen is that you need to keep your follow up simple. 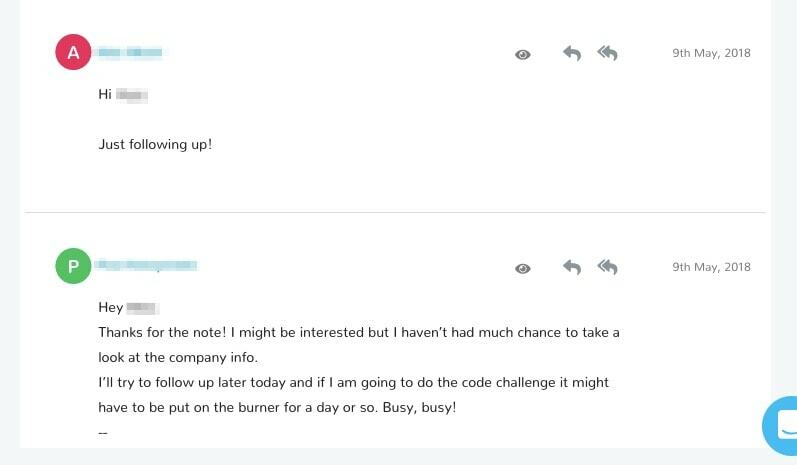 Just saying – “Hey First name, I know you might be super busy but I thought I should follow up” would go a lot further than you would’ve imagined. Simple follow-ups work because your prospective candidate is not expecting another email. It sets you apart from the legion of other recruiters out there trying to woo the candidate. If you are new to this, there are a few email templates that can help you get started. Find them here and here. If you are a pro, share your tricks and tips with us in the comments. About the author: Manan Shah is co-founder and CEO of Recruiterflow – a modern applicant tracking system that makes sourcing and engaging candidates a breeze.